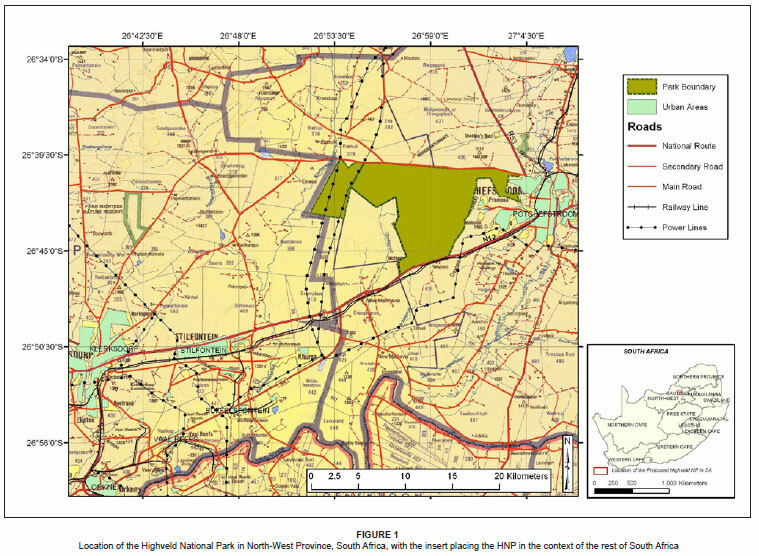 The proposed Highveld National Park (HNP) is an area of high conservation value in South Africa, covering approximately 0.03% of the endangered Grassland Biome. The park is situated immediately adjacent to the town of Potchefstroom in the North-West Province. The objective of this study was to identify, classify, describe and map the plant communities in this park. Vegetation sampling was done by means of the Braun-Blanquet method and a total of 88 stratified random relevés were sampled. A numerical classification technique (TWINSPAN) was used and the results were refined by Braun-Blanquet procedures. The final results of the classification procedure were presented in the form of phytosociological tables and, thereafter, nine plant communities were described and mapped. A detrended correspondence analysis confirmed the presence of three structural vegetation units, namely woodland, shrubland and grassland. Differences in floristic composition in the three vegetation units were found to be influenced by environmental factors, such as surface rockiness and altitude. Incidences of harvesting trees for fuel, uncontrolled fires and overgrazing were found to have a significant effect on floristic and structural composition in the HNP. The ecological interpretation derived from this study can therefore be used as a tool for environmental planning and management of this grassland area. Conservation implications: Grasslands are amongst the most threatened and least conserved vegetation biomes in South Africa, with less than 1.3% currently being conserved. The HNP has significant value for biodiversity conservation and the protection of this area will contribute to the preservation of the highly threatened Highveld vegetation types. Conservation strategies are being developed to expand the number and size of protected areas by incorporating communal lands. South Africa stands at the threshold of important and difficult socio-political decisions with respect to land restitution and redistribution (Fabricius, Koch & Magome 2001; Hoffman & Meadows 2002). New policies allow communities better access to natural resources and call for their participation in the management of protected areas, as well as facilitate the restitution of land from which they had been forcibly removed (Fabricius et al. 2001). Conservation agencies have, in some instances, been able to expand the size of the protected wildlife estate by entering into negotiations with local residents. This has resulted in a new category of protected areas called 'contractual parks'. In South Africa, examples of this co-management strategy include the Richtersveld National Park and the agreement with the Makuleke people in the Kruger National Park (Archer 1999; Steenkamp 1999). Although the Highveld National Park (HNP) is not regarded as a contractual park, all the stakeholders (South African National Parks, the Barolong Community, North-West Parks and Tourism Board, and the Tlokwe City Council of Potchefstroom) constitute the 'Founding Partners', with a memorandum of understanding regulating their respective rights and obligations within the park. This agreement defines the roles and responsibilities of the different partners, including the management and administration of the HNP. The establishment of the HNP aimed at conserving a considerable area of the poorly conserved Rocky Highveld Grassveld (Bredenkamp & Van Rooyen 1996a) and Dry Sandy Highveld Grassveld (Bredenkamp & Van Rooyen 1996b) of the western Grassland Biome in South Africa; areas which have been considered to be the most scenic landscapes in the western Grassland Biome (Mucina & Rutherford 2006). According to Fairbanks et al. (2000), almost 30% of the Grassland Biome of South Africa has been permanently transformed, primarily as a result of cultivation (23%), plantation forestry (4%), urbanisation (2%) and mining (1%). A further 7% has been severely degraded by erosion and agricultural development. In order to maintain biodiversity, it is important to conserve elements such as vegetation and soil, because their loss enhances erosion and reduces the productive value of the land (Hoffman & Todd 2000; O'Brien 2004). Urbanisation is a major contributor to the loss of natural areas in certain parts of the Grassland Biome (Cilliers, Müller & Drewes 2004), particularly in the Potchefstroom area. Although urbanisation in some provinces has been lower than South Africa's national figure of 53%, a rapid increase is expected in the future (Cilliers et al. 2004), as a result of the higher levels of poverty and fewer job opportunities in rural areas that have been caused by continued droughts, specifically in the North-West Province. The identification and understanding of plant communities, as well as their associated habitats, are of fundamental importance in the formulation and execution of conservation strategies for the HNP. The study focused on the area west of Potchefstroom (Figure 1), between 26º39'36'' S - 26º46'12'' S and 26º52'12'' E - 27º04'12'' E. The area for park development lies between the N12, running from Potchefstroom to Klerksdorp in the south and Eleazer road in the north. The park occupies approximately 10 200 hectares, which consists of a core area of Potchefstroom local authority land (5500 ha), Modderfontein (Defence Force Land, 2 700 ha), Nooitverwacht (privately owned land, 1500 ha)and the Agricultural College Farm (500 ha). The relatively heterogeneous geology is represented by the Witwatersrand and Ventersdorp supergroups and the Transvaal Sequence, with isolated occurrences of old Archaic granites and Karoo Sequence sediments (Bezuidenhout 1993). Soils in the study area are heterogeneous and vary from sandy to clayey, due to great variation in parent rock material (Land Type Survey Staff 1984). Four land types - Ba, Bc, Fa and Fb - occur in the HNP (Daemane 2007). A land type denotes an area that can be shown at a scale of 1:250 000, displaying marked degree of uniformity with respect to terrain form, soil pattern and climate (Land Type Survey Staff 1984). The rainfall is erratic and varies from an average of 600 mm per annum, to exceptional occurrences of more than 900 mm per annum (Institute for Soil, Climate and Water 2003). The area is characterised by large seasonal and daily variations in temperature, from very hot in summer (daily average temperatures may exceed 32 ºC in January), to mild to cold in winter, with average minimum monthly temperatures of up to 12 ºC (ISCW 2003). The North-West Province encloses two major biomes: the Grassland and the Savanna Biome. The Grassland Biome in this study was represented by the Vaal Reefs Dolomite Sinkhole Woodland (Gh 12), the Rand Highveld Grassland (Gm 11), the Klerksdorp Thornveld (Gh 13), and the Carletonville Dolomite Grassland (Gh 15) of the Dry Highveld Grassland Bioregion Unit (Mucina & Rutherford 2006). The Savanna Biome, represented by the Central Bushveld Bioregion Unit, consists of Andesite Mountain Bushveld (SVcb 11). Low & Rebelo (1996) classified this area under the Rocky Highveld Grassland and Dry Sandy Highveld Grassland. The Bankenveld vegetation type (Veld Type 61), which Acocks (1953) described as 'false grassveld', is dominant in the HNP; the climax of this veld type is open Acacia caffra woodland. Vegetation sampling was undertaken to represent the communities of the HNP and consisted of 88 relevés of 900 m2, each randomly placed within the stratified units. Stratification was done on 1:50 000 scale aerial orthophotographs, on the basis of relatively homogeneous physiographic and physiognomic units. Following Bezuidenhout (1993), further stratification was carried out by recognising the terrain types associated with topographical positions, such as the crest, midslope, footslope, valley bottomlands and floodplains. The TWINSPAN classification algorithm (Hill 1979), which is regarded as a very successful approach by many phytosociologists (Mucina & Van der Maarel 1989; Bredenkamp & Bezuidenhout 1995; Cilliers 1998), was used as a first analysis for the floristic data. The TWINSPAN classification was then refined further, by application of Braun-Blanquet procedures by means of the BBPC-program (Bezuidenhout, Biggs & Bredenkamp 1996). Detrended correspondence analysis (DCA; Hill 1979) was applied to the data set to confirm the phytosociological association and to assess floristic relations between communities. The stepwise ordination approach followed by Mucina & Van Tongeren (1989), was adopted to cope with the heterogeneity of the data set. Descriptive terms such as 'differential' and 'dominant species' were used following Kent & Coker (1992) and Jennings et al. (2009). 'Differential species' refers to species of medium to low constancy, which tends to occur together in a series of quadrats and can thus be used to characterise groups. 'Dominant species' refers to species with the highest percentage of cover, usually in the uppermost dominant layer. The analysis of vegetation by phytosociological means, resulted in the identification of nine different plant communities (Figure 2), brief descriptions of which can be found in Table 1. The species groups within each plant community can be found in the phytosociological table (see Online Appendix). The presence of the municipal dumping site within the park is shown in the map (Figure 2) and its implications are highlighted in the discussion section. However, the area indicated as 'Spitskop' on the map is highly degraded; therefore, the plant communities found in this area do not form part of this discussion. 1. Mystroxylon aethiopicum - Pavetta zeyheri shrubland. This community is mainly limited to the rocky quartzite plateau and ridges of the study area. Rocks cover up to 73% of the soil surface. Glenrosa is the dominant soil form in this community. The differential species of this community include indigenous species such as Pavetta zeyheri, Mystroxylon aethiopicum, Grewia occidentalis, Vangueria parvifolia, Pappea capensis, Olea europaea subsp. africana and Panicum maximum (Species Group A). Dominant species include Themeda triandra, Elionurus muticus (Species Group U), Vangueria infausta subsp. infausta (Species Group C), and Acacia caffra (Species Group N). The average height of the tree stratum is 5.3 m, with a canopy cover of 19%. The average height of the herbaceous stratum is 0.9 m, with a canopy cover of 41%. On average, 33 species were recorded per sample plot, of which 1.2% was exotic species. Exotic plants included species such as Gomphrena celosioides and Opuntia ficus-indica (Species Group V). A closely related shrubland community, Pavetta zeyheri -Vangueria infausta of the Ba land type of the former western Transvaal, was described by Bezuidenhout, Bredenkamp and Theron (1994c) and corresponds with the Dry Sandy Highveld Grassland. The shrubland communities form a distinctive structural vegetation type within the matrix of the Dry Sandy Highveld Grassland. Only 0.28% of the Dry Sandy Highveld Grassland is currently being conserved in South Africa, while approximately 65% of this vegetation has been transformed (Bredenkamp & Van Rooyen 1996b). 2. Vangueria infausta subsp. infausta - Loudetia simplex shrubland. This community is associated with the midslopes of the rocky quartzite outcrops of the study area. The Mispah and Glenrosa soil forms are dominant in this habitat. Rocks cover up to 63% of the soil surface. The differential species of this community is Species Group B, which includes the grass Loudetia simplex, the shrub Mundulea sericea and a forb Helichrysum kraussii. The dominant shrub is Vangueria infausta subsp. infausta (Species Group C). The dominant grasses are Trachypogon spicatus and Andropogon schirensis (Species Group E), Schizachyrium sanguineum, Brachiaria serrata, Diheteropogon amplectens, Eragrostis racemosa, Melinis nerviglumis, and Aristida meridionalis (Species Group F), and Setaria sphacelata var. sphacelata and Eragrostis curvula (Species Group T). The average height of the tree stratum is 4.6 m and the average canopy cover is 6.8%, with Acacia caffra (Species Group N) forming the major tree component. The average canopy cover of the herbaceous stratum is 53.6%, with an average height of 0.8 m. On average, 34 species were recorded per sample plot, of which 1.6% was exotic species. Exotic plants included species such as Tagetes minuta (Species Group L), Verbena officinalis (Species Group S), and Conyza bonariensis, Achyranthes aspera and Nicotiana longiflora (Species Group V). Cilliers, Schoeman & Bredenkamp (1999) described a closely related shrubland community (Vangueria infausta subsp. infausta - Rhus pyroides) in the semi-urban area of Potchefstroom. 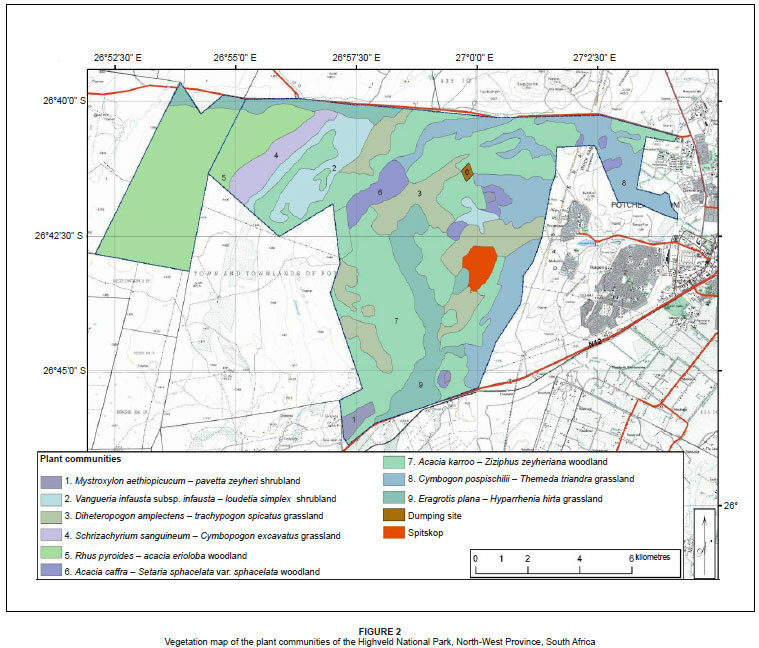 According to their findings, the lack of the Acacia caffra and the dominance of Rhus pyroides in the semi-urban area of Potchefstroom is possibly a result of the encroachment of Rhus pyroides from the adjacent dolomitic and chert grasslands of the Fa land type. A similar community, the Vangueria infausta subsp. infausta - Acacia caffra woodland was described for the Bc land type of the former western Transvaal Grassland (Bezuidenhout & Bredenkamp 1991). According to Bezuidenhout & Bredenkamp (1991), the Bc land type can be divided into two broad physiognomic classes, namely woodland and grassland. The woodland competes with the grassland for more or less the same habitat. The grassland is often overgrazed and burned and the dominance of Mundulea sericea is indicative of these disturbances. These shrubland communities, typical of the Rocky Highveld Grassland (Bredenkamp & Van Rooyen 1996a), are well worth conserving. 3. Diheteropogon amplectens - Trachypogon spicatus grassland. This grassland occurs mostly on the rocky plains and midslopes. The geology in this community is characterised by quartzite and andesitic lava. Rocks cover 48% of the soil surface. The soil forms comprise the Mispah and Glenrosa. Differential species of this community, indicated by Species Group D, include the grass - Brachiaria nigropedata, the forbs - Helichrysum nudifolium var. nudifolium and Chascanum adenostachyum, and the succulent - Aloe zebrina. The dominant grass species in this community are Diheteropogon amplectens (Species Group F) and Trachypogon spicatus (Species Group E). The average height of the herbaceous stratum is 0.9 m and the canopy cover is 65%. The average height of the tree stratum is 4.6 m, with a canopy cover of 3.8%; Acacia caffra (Species Group N) is the main component of this stratum. The average height of the shrub stratum is 1.5 m, with a canopy cover of 9%. On average, 33 species were recorded per sample plot, with the only exotic species (0.2%) found in this community being Conyza bonariensis (Species Group V). A similar plant community, the Trachypogon spicatus -Diheteropogon amplectens grassland from the dolomitic region in the Potchefstroom-Ventersdorp-Randfontein area, was previously described by Bezuidenhout & Bredenkamp (1990). Other closely related communities described by Bezuidenhout, Bredenkamp and Theron (1994b) include the Diheteropogon amplectens - Schizachyrium sanguineum grassland from the Fb land type. Bezuidenhout et al. (1994b) also found that the Diheteropogon amplectens - Trachypogon spicatus grassland occurs in the Fb land type and, although it is still relatively undisturbed, it is highly threatened by mining and industrial activities elsewhere and is therefore worth conserving. Cilliers et al. (1999) described the Schizachyrium sanguineum - Diheteropogon amplectens grassland in the natural and semi-natural areas in the municipal area of Potchefstroom, noting that the variation between these previously described communities could be contributed to factors such as altitude, terrain type, soil type, soil depth and rockiness of soil surface. 4. Schizachyrium sanguineum - Cymbopogon excavatus grassland. This community is associated with the midslopes of the chert outcrops, where Mispah is the dominant soil form. Rocks cover 37% of the soil surface. No differential species were identified in this community, but it is characterised by the absence of species within Species Groups A and C. The dominant species are Schizachyrium sanguineum, Cymbopogon excavatus, Brachiaria serrata, Diheteropogon amplectens, and Dicoma anomala (Species Group F), Heteropogon contortus (Species Group Q), Eragrostis curvula (Species Group T), and Pseudognaphalium undulatum (Species Group S). The average height of the herbaceous stratum is 0.7 m and it has a canopy cover of 66.3%. The average height of the tree stratum is 6.8 m, with only a poor canopy cover of 1.5%. Celtis africana and Acacia erioloba (Species Group G) are the only tree species in this community and are very poorly represented. On average, 54 species were recorded per sample plot, of which 0.7% was exotic species. Exotic plants included species such as Conyza bonariensis and Achyranthes aspera (Species Group V). Bezuidenhout & Bredenkamp (1990) described a closely related community, Aristida diffusa - Cymbopogon excavatus grassland, as also occurring on the stony chert areas of the dolomitic region in the Potchefstroom-Ventersdorp-Randfontein. Another related community, Cymbopogon excavatus - Diheteropogon amplectens Grassland, found in the former western Transvaal dolomite and chert grassland, was described by Bezuidenhout, Bredenkamp and Theron (1994a). He associated this grassland with the high-lying areas of the Fa land type, which has a high conservation status due to its floristic and habitat diversity. 5. Rhus pyroides - Acacia erioloba woodland. This woodland is limited to the valley bottomlands of the chert and dolomitic areas. Mispah is the dominant soil form in this community, with rocks forming 30% of the soil surface. Sinkholes, underlain by dolomite, are present in this habitat and mostly filled by deep sandy soil (> 1.2 m). Differential species of this community, indicated by Species Group G, include Eragrostis superba, Sporobolus africana, Eragrostis trichophora, Celtis africana, Acacia erioloba, Diospyros lycioides subsp. guerkei, Ipomoea oblongata, Sida dregei, and Striga asiatica. Dominant species in this plant community are Acacia erioloba (Species Group G), Triraphis andropogonoides (Species Group H), Ehretia rigida (Species Group L), Rhus pyroides (Species Group M), and Cymbopogon pospischilii (Species Group Q). The average height of the tree stratum is 5.7 m, with a canopy cover of 4.8%. The trees are restricted to deep sandy soils in the sinkholes. The average height of the shrub stratum is 2.8 m, with a canopy cover of 15.6 m. The average height of the herbaceous stratum is 0.8 m, with a high canopy cover of 67%. The succulent Lithops lesliei is also found in this community (Species Group V). On average, 40 species were recorded per sample plot, of which 4.5% was exotic species. Exotic plants included Tagetes minuta (Species Group L) and Conyza bonariensis, Achyranthes aspera, Bidens bipinnata, and Solanum nigrum (Species Group V). A closely related woodland community, Rhus lancea - Acacia erioloba in the former western Transvaal (Bezuidenhout et al. 1994b), shares a similar floristic composition with the Rhus pyroides - Acacia erioloba woodland, except for the dominance of Rhus pyroides in the current study. The Rhus - Acacia woodland is aesthetically associated with the most scenic landscapes in the western Grassland Biome and certainly deserves high conservation priority (Bezuidenhout 1993). This community also falls within the Vaal Reefs Dolomite Sinkhole woodland (Gh 12), which occurs naturally in clumps around sinkholes, especially in places of dolomite outcrops (Mucina & Rutherford 2006). The HNP is supposed to conserve a considerable area of this vegetation unit (Mucina & Rutherford 2006). Gathering of wood for fuel by rural poor communities is the most significant threat to this plant community. 6. Acacia caffra - Setaria sphacelata var. sphacelata woodland. The Setaria sphacelata var. sphacelata - Acacia caffra woodland is mainly associated with the andesitic lava and quartzite midslopes of the rocky outcrops in the study area. Rocks cover 27% of the soil surface. Glenrosa is the dominant soil form, with Mispah and Hutton to a lesser extent. The differential species in this community are found in Species Group I and include the grasses - Digitaria eriantha, Eragrostis rigidior and Aristida transvaalensis, the forbs - Crabbea angustifolia, Blepharis integrifolia, Indigofera heterotricha and Chaetacanthus costatu, the tree Euclea undulate, and the shrub Rhus leptodictya. Dominant species in this community include Setaria sphacelata var. sphacelata (Species Group T), Acacia caffra (Species Group N), Pseudognaphalium undulatum, Aloe greatheadii var. Davyana, and Clematis brachiata (Species Group N), Ziziphus zeyheriana (Species Group Q), and Acacia karroo (Species Group S).The average height of the tree stratum is 5 m, with a canopy cover of 11.2%. The average height of the shrub stratum is 1.9 m, with a canopy cover of 17.9%. The average height of the herbaceous stratum is 0.9 m, with a canopy cover of 61.7%. On average, 40 species were recorded per sample plot, of which 6.6% was exotic species. Exotic plants included species such as Tagetes minuta (Species Group L), Verbena officinalis (Species Group S), Paspalum dilatatum, Conyza bonariensis, Achyranthes aspera, Bidens bipinnata, Gomphrena celosioides, Schkuhria pinnata, Verbena bonariensis, Gulleminea densa, Plantago lanceolata, Solanum sisymbriifolium, Chenopodium album, Opuntia ficus-indica, Oxalis corniculata, Zinnia peruviana, Oenothera tetraptera, and Cirsium vulgare (Species Group V). Bezuidenhout et al. (1994b) described a closely related community, Rhus leptodictya - Acacia caffra woodland of the Fb land type in the former western Transvaal Grassland. Another related community (Vangueria infausta - Acacia caffra woodland) of the Bc land type in the former western Transvaal Grassland, was described by Bezuidenhout & Bredenkamp (1991). These communities correspond with the Andesite Mountain Bushveld (SVcb 11), described by Mucina & Rutherford (2006), which is dominated by species such as Acacia karroo, Acacia caffra and Ziziphus zeyheriana. Intensive mining of the gold-bearing quartzitic rocks of the Witwatersrand supergroup has caused destruction and degradation to much of the vegetation within the Fb land type (Bezuidenhout 1993). Uncontrolled fires, gathering of trees for fuel wood and accompanying disturbances, such as trampling and soil compaction, are also significant threats to these communities (Cilliers et al. 1999). 7. Acacia karroo - Ziziphus zeyheriana woodland. The Acacia karroo - Ziziphus zeyheriana Woodland occurs on footslopes, valley bottomland areas and along the drainage lines and, occasionally, on the midslopes in degraded areas. Rocks cover 3% of the soil surface, with Glenrosa and Hutton as the dominant soil forms in this community (although Mispha and Shortland occur in few relevès). The geology is mainly quartzitic, with andesitic lava in few relevès. The differential species in this community include Delosperma herbeum, Nidorella anomala, Sida spinosa, Pavonia burchellii, Pollichia campestris, Pentzia globosa and Eragrostis lehmanniana (Species Group J). Dominant species are Ziziphus zeyheriana (Species Group Q), Acacia karroo (Species Group S), Asparagus suaveolens (Species Group K), Ehretia rigida (Species Group L), Aloe greatheadii var. davyana, Clematis brachiata, and Acacia caffra (Species Group N), Cymbopogon pospischilii and Teucrium trifidum (Species Group Q), Cynodon dactylon and Asparagus laricinus (Species Group S), and Setaria sphacelata var. sphacelata (Species Group T). The average height of the tree stratum is 4.5 m and the canopy cover is 17.2%. The average height of the shrub stratum is 1.8 m, with a canopy cover of 21.9%. The average height of the herbaceous stratum is 0.9 m, with a canopy cover of 6.5%. On average, 41 species were recorded per sample plot, with 7.2% exotic species. Exotic plants included species such as Tagetes minuta (Species Group L), Verbena officinalis (Species Group S), Conyza bonariensis, Achyranthes aspera, Bidens bipinnata, Gomphrena celosioides, Lepidium bonariensis, Schkuhria pinnata, Solanum sisymbriifolium, Opuntia ficus - indica, Oxalis corniculata, and Zinnia peruviana (Species Group V). Bredenkamp, Joubert and Bezuidenhout (1989) described a similar community (Acacia karroo woodland) in the Potchefstroom-Fochville-Parys area, with Ziziphus zeyheriana abundantly occurring in severely degraded areas. They also stated that this community is an encroachment of the Acacia karroo woodland into grassland communities. The conservation value of this vegetation type, based on the variety in habitat and floristic diversity, was emphasised by Bezuidenhout et al. (1994b) in the syntaxonomy of the vegetation of the Fb land type in the former western Transvaal Grassland. 8. Cymbopogon pospischilii - Themeda triandra grassland. This grassland is associated with the rocky quartzite midslopes of the study area. Rocks cover 3% of the soil surface, with Glenrosa, Hutton and Shortland as the dominant soil forms. The differential species in this community are in Species Group O and include species such as Hibiscus pusillus, Convolvulus sagittatus, Eragrostis chloromelas, Menodora africana, Gladiolus splendens, Helichrysum rugulosum, Gymnosporia buxifolia, and Anthospermum hispidulum. Dominant species in this community are Cymbopogon pospischilii and Ziziphus zeyheriana (Species Group Q), Themeda triandra (Species Group U) Hermannia depressa (Species Group P), Berkheya radula, Hyparrhenia hirta, Setaria incrassata, and Helichrysum nudifolium var. nudifolium (Species Group R), and Acacia karroo and Conyza podocephala (Species Group S). The average height of the tree stratum is 5.4 m, with a canopy cover of 9.8%. The average height of the shrub stratum is 1.2 m, with a canopy cover of 8.2%. The average height of the herbaceous stratum is 0.9 m, with a canopy cover of 77%. On average, 31 species were recorded per sample plot, of which 6.3% was exotic species. Exotic plants included species such as Tagetes minuta (Species Group L) Verbena officinalis (Species Group S) Conyza bonariensis, Achyranthes aspera, Avena fatua, Bidens bipinnata, Gomphrena celosioides, Physalis angulata, Oenothera rosea, Oenothera tetraptera, and Cirsium vulgare (Species Group V). A closely related plant community (Themeda triandra - Elionurus muticus grassland) with an absolute dominance of Themeda triandra, was described by Bredenkamp, Joubert and Bezuidenhout (1989) in a reconnaissance survey of the vegetation of the plains in the Potchefstroom-Fochville-Parys areas. In the Bc land type, the Cymbopogon pospischilii - Themeda triandra grassland shares floristic characteristics with the Themeda trianda, a variant described by Bezuidenhout & Bredenkamp (1991), who found vegetation associated with these plant communities to be in a state of degradation, due to continued overgrazing by domestic stock. 9. Setaria incrassata - Hyparrhenia hirta grassland. The Setaria incrassata - Hyparrhenia hirta grassland is restricted to the valley bottomlands and floodplains, and in or along drainage lines within the study area. The geology comprises mostly colluvial deposits from the upper slopes. Rocks cover 1% of the soil surface. This habitat is fairly unstable due to seasonal flooding and drying. Hutton and Swartland are the dominant soil forms found in this habitat. No differential species were identified in this community. Setaria incrassata and Hyparrhenia hirta (Species Group R) are the dominant species. The average height of the herbaceous stratum is 0.9 m, with a high canopy cover of 69%. The average height of the shrub stratum is 0.8 m, with a poor canopy cover of 1.3%. The average height of the tree stratum is 3 m and a canopy cover of 6%. On average, 24 species were recorded per sample plot, of which 12% was exotic species. Exotic plants included Verbena officinalis (Species Group S), and Paspalum dilatatum, Conyza bonariensis, Ciclospermum leptophyllum, Persicaria lapathifolia, Oenothera rosea and Oenothera tetraptera (Species Group V). Several researchers have done studies on similar wetland grassland communities. Bredenkamp et al. (1994) described a Hyparrhenia hirta grassland in the Boskop Dam Nature reserve, Bezuidenhout et al. (1994b) described a Hyparrhenia hirta - Eragrostis plana grassland in the Fb land type in the fomer western Transvaal, and Cilliers et al. (1998) gave an account of a Hyparrhenia hirta grassland in the Potchefstroom municipality. The similarity found in all these communities was that their habitats were fairly unstable due to seasonal flooding and drying which, together with the frequent overgrazing of these sites, caused an advanced state of degradation of the vegetation. DCA was applied to the data set to confirm the existence of the different plant communities and to determine whether the gradients in the plant communities along different ordination axes could be explained by gradients in specific environmental characteristics. The gradient along ordination axis 1 (E = 0.65) could be explained by surface rockiness (Figure 3). Plant communities to the left of the scatter diagram (plant communities 1 and 2) are characterised by a largely rocky soil surface (> 50%), while those on the right (plant communities 7, 8 and 9) are characterised by fewer rocks on the soil surface (0% - 25%). Plant communities at the centre of the scatter diagram (plant communities 3, 4, 5 and 6) are characterised by a moderately rocky surface (25% - 50%). The gradient along ordination axis 2 (E = 0.45) could be explained by altitude. Plant communities at the top of the scatter diagram occurred mainly on the rocky quartzite plateau and crests in the HNP. Plant communities found at the bottom of the scatter diagram are associated with relatively low altitudes and occur mainly in the valley bottomlands of the cherts and dolomitic areas. Three structural vegetation units, namely woodland, shrubland and grassland, were identified in the HNP. The DCA-ordination also confirmed the relationship between the plant communities and the environmental gradients. Many of the plant communities previously described in the grassland of the former western Transvaal also show floristic and habitat affinities with the plant communities described in the present study. The Acacia karroo woodland, as well as several grassland communities, occurs on the plains, while Acacia caffra woodland occurs on the rocky outcrops and hills (Bezuidenhout & Bredenkamp 1991; Bezuidenhout et al. 1994a; Bezuidenhout et al. 1994b). The plant communities described in the present study also fall within the poorly conserved Rocky Highveld and Dry Sandy Highveld Grasslands previously described by Bredekamp & Van Rooyen (1996a; 1996b). These vegetation types are highly threatened by urbanisation, mining and agriculture. The HNP aims to conserve a considerable area of the Vaal Reefs Dolomite Sinkhole Woodland (Gh 12), because, according to Mucina and Rutherford (2006), this is one of the most scenic landscapes in the western Grassland Biome. Mucina and Rutherford (2006), also point out that almost a quarter of this vegetation unit has already been transformed by mining (the region contains possibly the highest concentration of mines in South Africa), cultivation, urban sprawl, and road construction. Five alien species belonging to Category 1 plants were identified in the HNP. Category 1 plants are described as prohibited species that should not be tolerated because they are able to invade undisturbed environments and transform or degrade natural plant communities (Henderson 2001). These five species are Opuntia ficus-indica (Species Group S), and Achyranthes aspera, Cirsium vulgare, Solanum elaeagnifolium, and Solanum sisymbrifolium (Species Group V). Focus should be given to plant communities 6 and 7, as they both have the highest number of category 1 species, with 6.6% and 7.2 % per sample plot, respectively. Even though plant community 9 has the highest number of alien species per sample plot (12%), no Category 1 species were found in this community. Control of these species should aim towards their long-term reduction in density and abundance. It is therefore crucial to prevent the further spread of alien plants into un-invaded areas by isolating the dense patches within the landscape through appropriate control measures and monitoring. The unique scenario of the existence of the municipal dumping site within the park is a cause for concern and it cannot be emphasised enough that proper management and control of the dump site is crucial. Landfill exfiltration and water leakage can adversely affect the quality of the adjoining soils and consequently affect the flora and fauna in the adjoining areas. Air pollution and wind-carried suspensions can also have direct effects in the park. Although the current operations ensure that storm water drains away from the waste to prevent contamination of any runoff, the closure and rehabilitation of the dump is recommended. The aesthetics of the park are compromised by the dump, its associated infrastructure and heavy traffic. The HNP is also threatened by increasing urbanisation, which is why it is crucial to recognise the threats to biodiversity and to understand the factors that will influence the management of the park. For example, settlements along the park's border pose a threat to the park on a number of levels, including giving rise to noise, air and land pollution, the loss of wilderness ambience, as well as representing a sustained pressure on natural resources. South African cities, including Potchefstroom, have witnessed an increase in the number of informal settlements on their urban fringe. There has also been an increase in squatting and informal settlements in rural areas, where fewer job opportunities exist and higher poverty levels are prevalent (Cilliers et al. 2004). Incidences such as fence cutting, harvesting of trees for firewood, uncontrolled fires and overgrazing, are just a few of the challenges that face the HNP. Therefore research on the HNP should focus not only on those problems that can be measured ecologically, but also those that allow for sustainable resource use. This highlights the importance of conservation to the economy in general, and to people's lives, in particular. The rural and urban poor are those most affected because they depend directly on the natural environment for their livelihood. Considerable areas covered by plant communities have not only been transformed by urban sprawl, but existing plant communities on the urban fringe of Potchefstroom are also highly fragmented (Cilliers et al. 2004). The fundamental role of protected areas has been to separate elements of biodiversity from processes that threaten their existence, by establishing them in remote areas (Margules & Pressey 2000). Recently, however, a more systematic approach to locating and designing protected areas has been evolving - one in which the influences of communities are taken into consideration. This approach needs to be implemented if a large proportion of today's biodiversity is to endure in the future. The park has not yet been proclaimed, but is currently under the management of North-West Parks and Tourism Board. It will therefore require a management plan that will provide an overarching spatial planning framework. Such a framework should address issues regarding urban development close to the park, as well as its future expansion. The ecological interpretation derived from this study can be used as a tool for environmental planning, management and conservation of this grassland area. The following individuals and institutions are sincerely thanked: South African National Parks for financing this study, North-West University for supporting this research, Dr. Stephen Holness and Ms. Phozisa Mamfengu for assisting with maps, and Mr. Abbey Legari for assisting with field work and the Highveld National Park' Founding Partners for allowing us to undertake this study.